Outpost: Titan is an action packed arcade game that will keep you on the edge of your seat. Take command of Outpost: Titan, a remote Starbase orbiting the Saturn moon Titan. Your mission is to protect the Outpost from all attacks and to stop the enemy from reaching the moon at all costs. Wage battle against wave after wave of relentless enemy star ships. You will have to be fast and use your limited weapons wisely to defeat them. If you are skilled enough to vanquish the enemy’s entire fleet, you will face the destroy the enemy Mothership, the most powerful battle ship in the known galaxy. It may be too much for your little Outpost to handle. Are you up to the challenge? Get Outpost: Titan today and find out. Like the game? Become a Fan and follow Outpost: Titan on Facebook! 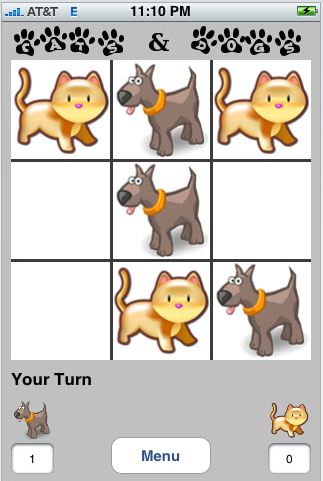 Cats and Dogs is a simple, fun twist on the old classic Tic Tac Toe game. Instead of X’s and O’s which are boring we use Cats and Dogs instead! Play single player against the iPhone or play two player with a friend. Cats and Dogs is good, silly fun for young kids, old kids or for adults alike. Are you into poker? If so, then you need to check out the Hold Em Analyzer. 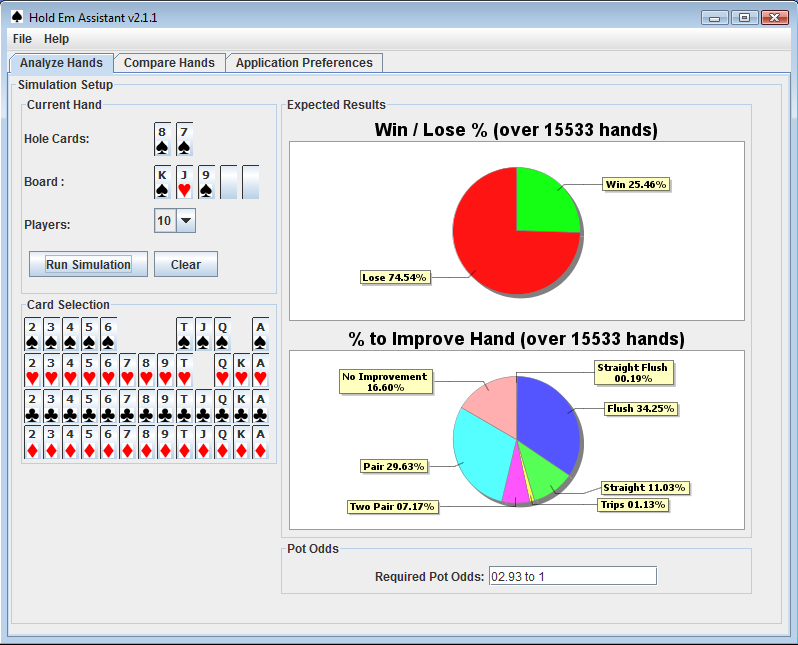 The Hold Em Analyzer is a tool that allows you to analyze, adjust and bring your poker game to the next level. As you can see the Hold Em Analyzer provides a lot of analytical tools that you can use to power up your game. You can use the Hold Em Analyzer to help boost your online play, real time – or you can use it after a session to see how you played. 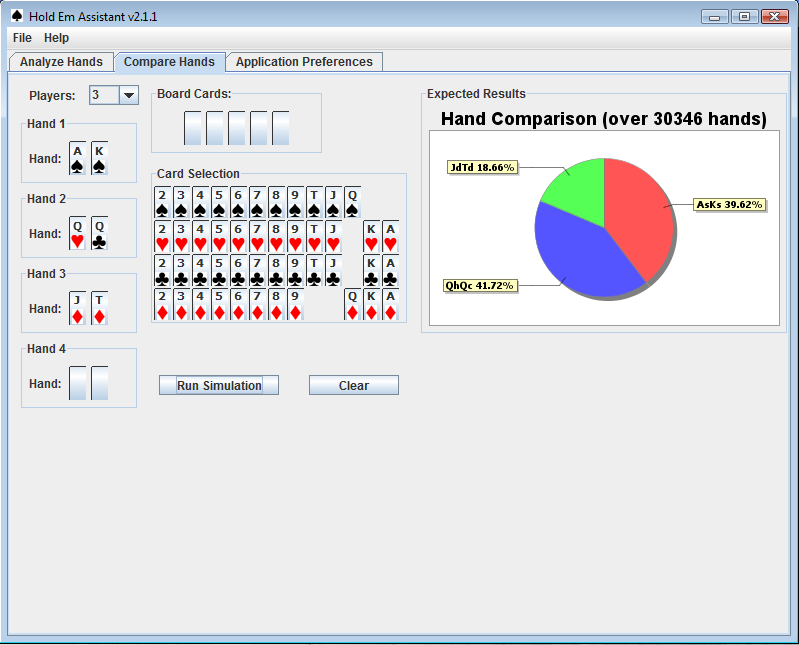 Hold Em Analyzer is written in Java and can run on any modern computer platform. A Windows Installer is available for ease of use, but you can run this on any platform that has Java installed, including Linux, Mac OS X and Solaris. You can purchase the Hold Em Analyzer now for $29.99. Once you order the software will be delivered via email within a few hours. PS. If you are interested in using the core code behind Hold Em Analyzer in a project of your own, such as a poker bot, or in a poker game for AI – a non-exclusive right to use license to the source code for Hold Em Analyzer is available for $499. Contact me to arrange a license purchase for the source code.